Tourist Information is available from local Travel Agents. A detailed map of the Town is also on display at High Street, opposite Cre na Cille Restaurant. The Catholic Cathedral was built between 1827 and 1836 during a famine period in parts of the West of Ireland. The building of the Cathedral was commenced by Archbishop Oliver Kelly, Archbishop of Tuam 1815 to 1834 and it was completed By Archbishop Oliver MacHale, Archbishop of Tuam 1834 to 1881. There are many interesting facets to this limestone building, the classic faces around the windows the humerous faces at the rear of the Cathedral and the stain glass windows by The Harry Clarke studios which date from the early 20th century. Teample Jarlath (The place of Jarlath) is the next stop for visitors and here we can see the remnants of the earliest monastic settlement which established Tuam as a population centre. The next stop for visitors is St. Mary's Cathedral. 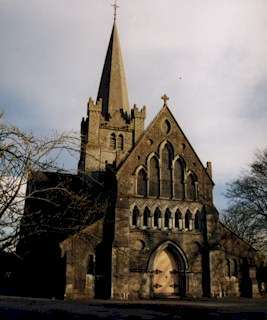 It is the Church of Ireland Cathedral in Tuam and parts of this building date from the 12th, 14th and 19th centuries. 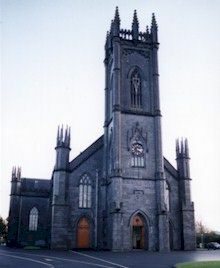 This Cathedral also houses The High Cross of Tuam which was erected in the south transept of the 19th century building. St. Mary's also houses a cross shaft which also dates from the 12th century. The cross head from St. John's Abbey which also dates from the 12th century is housed in the Synod Hall, the fourteenth century building. St. Mary's has many interesting features which include the 19th century stain glass windows by McAlister, housed in the Synod Hall and the late 19th century stain glass windows in the 19th century building, some depicting the faces of real people, one time parishioners in the Cathedral. Major renovations took place at St. Mary's Cathedral from 1985 to 1993 and an all new central heating system was installed during September 2000. The last stop on the walking tour of the Town is a visit to The Mill Museum with its still working water wheel and machinery still intact. The Museum was established as a voluntary community project in 1974 and still continues as such. 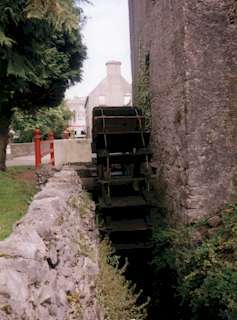 It is the only preserved working corn mill in the West of Ireland and its history dates back the the late 17th century. During the penal laws Mass was not publically celebrated in Tuam .In Sylane, near Tuam there is an open pit called Clais an Aifrinn in which an altar and cross is erected to commerate the time when Fr Ulick Nally, P.P Cummer celebrated Mass there for his people. Cathedral of the Assumption the location at which St Jarlaths chariot wheel came undone. Clas an Aifrinn ,where Mass was celebrated in Penal Times. Directions – from town centre, .5km towards Galway, first turn right at lights, 2km to Sylane.